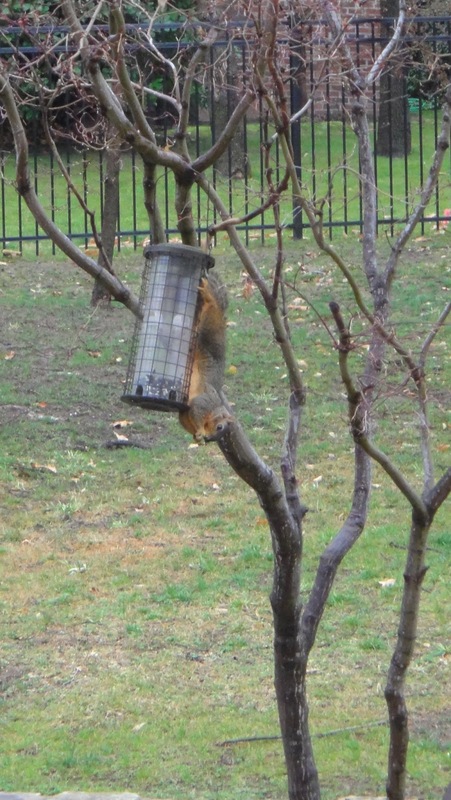 Here’s a picture of the squirrel that eats every morning from our squirrel-proof birdfeeder. He hangs upside down and somehow manages to scoop out the seeds with his tiny squirrel paw. He’s pretty good at it, but he does leave a mess on the ground below the feeder when he’s done. I don’t mind him. Who knows what he’s been through in life to lead him to our feeder every morning? Maybe he’s just trying to feed his squirrel family. Maybe he’s been laid off from his job as nut sorter at the Willy Wonka factory. Maybe he can’t find another job because he’s squirrel. People say that squirrel racism is in our past, but I guarantee that if you give an employer two identical resumes yet one is a human and one is squirrel, they will go with the human every time. Squirrel bigotry is alive and kicking. I bet people have nasty assumptions about him like if they give him a job he would just poop in the office. Yeah, ok he would totally poop in the office, but still, he’s probably a good squirrel. Maybe people keep telling him that he should pull himself up by his bootstraps, but I don’t think they even make squirrel boots, do they? Maybe he had to go on food stamps and all he can afford is over-processed acorns full of sugar because it’s the most calories for his dollar yet people judge him every time he’s in the check-out lane and say “Look at that deadbeat, wasting our tax dollars on crap food” and “Hey, look, a squirrel in a grocery store!”. Maybe he’s just trying to do the best he can and give his squirrel children a healthy meal. So go ahead squirrel, I won’t judge. Just leave some for the birds. They may have had it rough, too. LOL... I'd say he's workin' hard for his meal. Being currently out of work and on Unemployment, I understand his plight. I say squirrels have got to eat too! The squirrels have to eat also!!! My Moma has squirrel feeders set up also beside her bird feeders. Just corn cobs, but I think they still eat the bird food. Must be dessert. Maybe he's just a little nutty...hahaha couldn't resist. Sorry!